Still people have a role in this story. 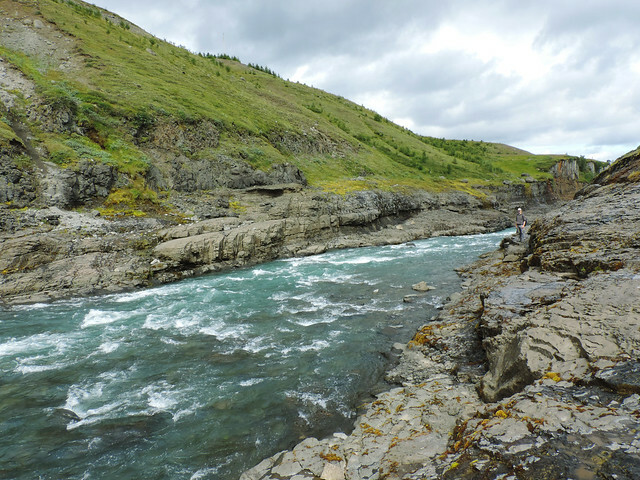 Though the sculptor of the canyon was nature, it was people who built a hydroelectric plant and created a reservoir on Jökulsá á Brú river. 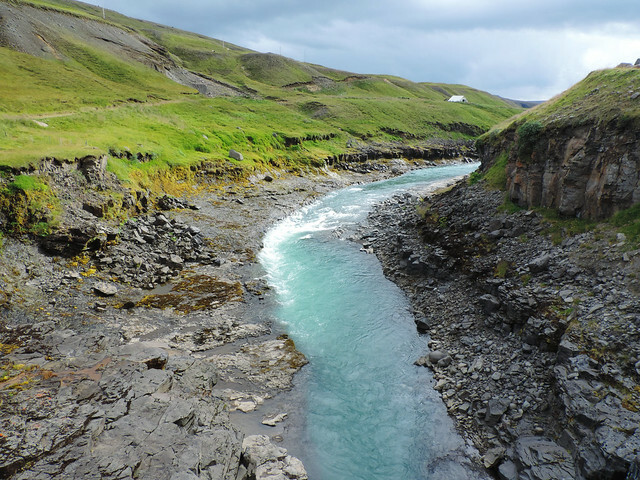 This affected the sources of this previously forceful glacial river that carried a vast amount of sand, dirt and mud from Vatnajökull glacier and turned it into the calm, clear, turquoise spring-fed river we see today. The water level is also much lower and that makes it possible to see the Basalt Column Canyon that was previously under water. So how to find this wonder? When heading to Northern Iceland from Egilsstaðir we turned to Road 923 from the Ring Road and drove to the farm called Klaustursel. It was easy to recognise the small parking lot by the bridge and easy things ended with that. We were supposed to follow the trail from the bridge but we couldn’t find one. We assumed it should be the road leading towards the nearby farms then. 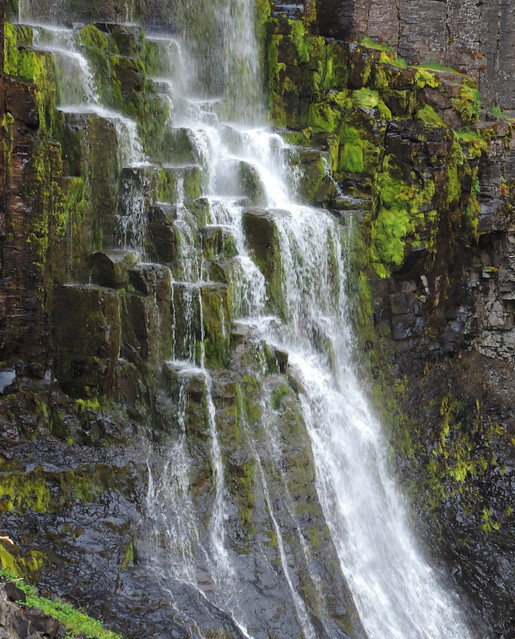 Soon we found Stuðlafoss, the Basalt Column Waterfall that is halfway to the canyon. But then the road took a turn and it headed to a very different direction to where the canyon was supposed to be. So we followed the narrow paths along the fences of the farms instead and checked our GPS regularly. We almost turned back – not once but like after every 20 minutes. Will we really find some spectacular canyon here? How come there’s no trail leading to it then? Well, there is a very spectacular canyon there – and we have no idea whether there’s any trail. Just as there’s no trail to the canyon, there’s no trail down to the canyon either. But we were able to find several spots where we could safely climb down and see it up close. 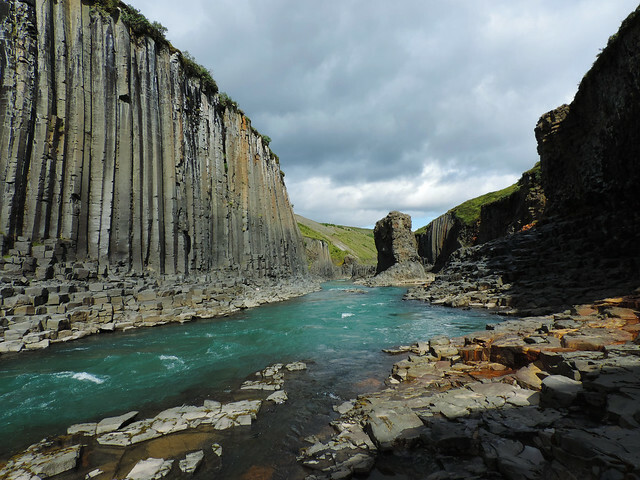 Looking up at the huge basalt columns made us realize the sheer power and beauty of nature. Sitting on the rocks and staring at the turquoise river felt like the perfect definition of peace. 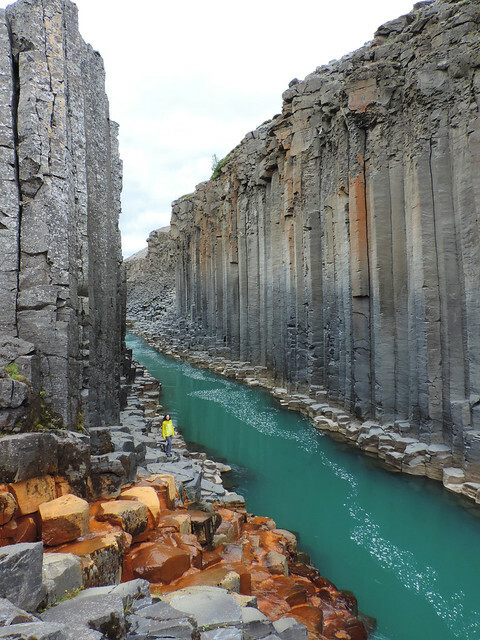 Stuðlagil, the Basalt Column Canyon is a great example of the rewards Iceland has for you if you don’t rush through it but take your time and wander around. Honestly, we were a bit hesitant whether to share this fabulous secret spot of ours. But others have already done that anyway. We read about this place and that’s why we searched for it in the first place. It takes some effort to find but it’s worth all that and more. Moreover, we had it all to ourselves and we’ve met only two people all day. What is the most spectacular canyon you’ve seen? Anyway, trying to find your directions on google Maps, I found another Studlafoss, way more to the center of Iceland. So I guess it is not that one. Also, I found no 923 road, only 925. Are there other directions I could follow on Maps? We plan to go there this year and it would be great if we could try this beautiful place! Guesthouse Skjöldólfsstadir along the Ring Road on Google Maps. Right after it, you can see the crossing with Road 923. This road took us to a bridge over Jökulsá á Brú river, and we parked on the west side and crossed the bridge on foot. There are fenced farmlands along the river in the beginning, but we could get close to it at the part where the basalt formations were. 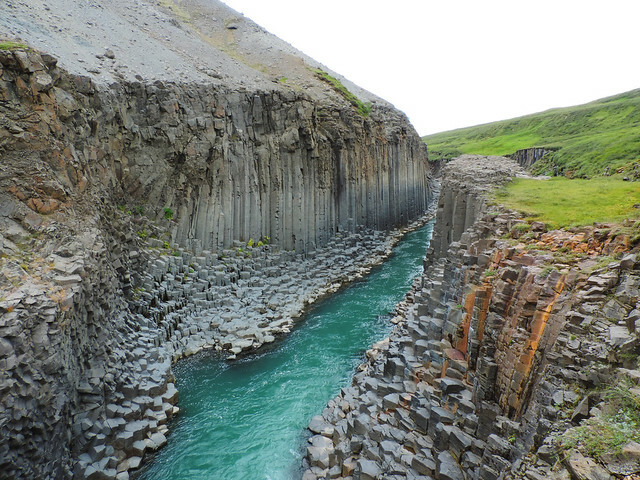 Google Maps doesn’t seem to know about the Studlafoss we found, but it’s on the way to the basalt canyon. However, you can search for Studlagil Canyon, and what Google Maps show you seem about correct.